We got an update that this picture is from Thailand, though it was sent to us as the good ol’ US of A. I will say that it’s pathetic that this was a true possibility in America. We should have caught it, since there were no $200 “Jordans” in the shoe line. I don’t recognize the new “Amerika.”And it shows government’s lack of innovation, because they could easily prevent such nonsense with a simple ticket system. Instead, the Fed has left it to the people to innovate, and they have responded. Instead of putting their minds to work at jobs, many lazy Americans are happy to be on the public dole. Since welfare is the job of many Americans, leave it to the “workers” to innovate. This is a picture of people waiting on welfare checks, and they have figured out how to NOT wait in line. Who wants to actually STAND in line, when their solution works just as well. Why interrupt “work” when their solution allows them to sit an play games or Skype on their ObamaPhones? Such is the state of our nation. 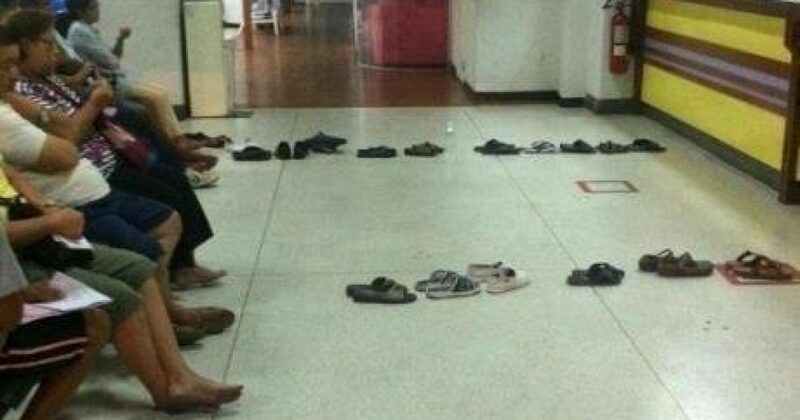 I suspect that welfare offices all across America have requisitioned for MORE CHAIRS, and little shoe pads where people can have their shoes wait in line on their behalf. And if my understanding of Liberalism is correct, soon there will be fights over whose shoes are where, and eventually some people will be shot, because somebody like somebody else’s shoes.